Civilization VI is getting a pretty hefty update later today, and the patch notes have been published. Headline news is the addition of new diplomacy options around joint wars, new historic moments, and a sweep of balance changes. See all your potential new allies in our Civ 6 faction guide. You can now ask other players or AI to join wars you’re already in, and choose a Casus Belli when declaring a joint war. There are 12 new historic moments, giving new sources of era score in the mid to late game. These include first national park, first seaside resort, first city with 25 population, first shipwreck excavated, and several firsts for fully developed districts. For all you data nerds, three new graphs tracking mechanics in the Rise & Fall expansion have been added to the game summary screen: era score, total governors, and total governor titles. 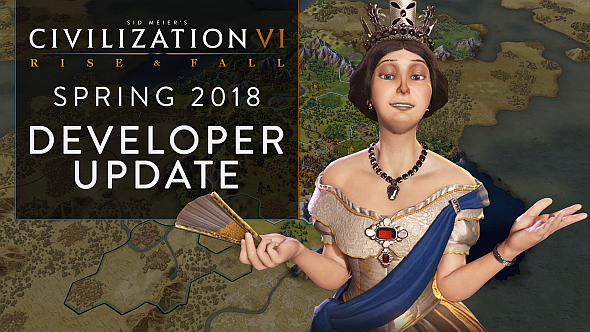 Balance changes have been made to governors, governments, and civs. Most notably, Victoria now gets a free melee unit when constructing Royal Navy Dockyards in cities on foreign continents; Lautaro can now hurt enemy loyalty by pillaging their city plots; and Seondeok’s ludicrous science generation has been nerfed – her governors now provide +3% science and culture for each promotion they’ve earned, rather than +10% regardless of promotions. That’s the big news, but there’s plenty more. You can watch Rise & Fall’s lead designer Anton Strenger watch you through the changes in the video above, or read them in full via the game’s blog.